DGS Library is a vibrant and stimulating space which is used regularly both for research and independent studying, as well as for relaxed and enjoyable reading. It is a welcoming and safe environment used by the whole school community on a daily basis, for teaching, learning and academic achievement. Follow the DGS Library on Twitter for exciting updates about library events and all-things books! The Library is open before school, at break time and lunch time, and after school, for students to study, read and borrow books. The Reading Ambassadors are a group of the school's keenest readers, who meet in the library every Wednesday lunchtime. As well as discussing their favourite books, the Reading Ambassadors actively promote reading in every part of the school by helping to plan and run events, assemblies and author visits. They are currently reading the Carnegie shortlist, which you can find out more about here. With the aim of nurturing a love for reading in younger students, the Reading Ambassadors have been taking part in paired reading with Rowling Class at Manor School this term. 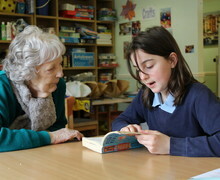 Last year, the Ambassadors paid regular visits to the Didcot Health and Wellbeing Centre to read with the clients there. Talks and workshops from published authors are a fantastic way of inspiring students to read. This year, Year 8 have welcomed Pam Smy, Year 9 have been educated about feminism by Holly Bourne, and our Patron of Reading, Jo Cotterill, has worked with Year 7 students, as well as getting involved in cross-curricular events throughout the school. As well as boosting literacy skills, Reading for Pleasure has proven mental health benefits. Library lessons for Years 7 and 8 give students the opportunity to discover the right books for them, and our Library Manager, Mrs Barnes, is always available to make recommendations. There are also mornings set aside for reading during Student Guidance Time. Students either read independently during this time, or their tutor will read aloud to them. In this way, we are hoping to promote a whole-school ethos of Reading for Pleasure. Since January 2019, we have been giving out gold stickers to students who are seen reading in their own time for 10 minutes or more. Students can collect these in their planners, and the student who has the most at the end of the academic year will be presented with a prize! Reading books from the school library has to be the easiest way to win extra points for your school house! One house point is awarded for every 10 books borrowed from the school library by someone in that house. The tutor group, as well as the individual student, who has borrowed the most library books over the course of the year is presented with a prize. For those students looking to push themselves, we have identified a list of 'Challenging Reads', which are categorised by difficulty into Bronze, Silver and Gold. Challenging reads earn students additional house points, with 2 points being awarded for every 10 Bronze books borrowed by someone in that house; 3 points being awarded for every 10 Silver books borrowed by someone in that house; and 4 points being awarded for every 10 Gold books borrowed by someone in that house. 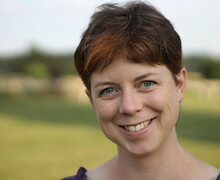 The award-winning author Jo Cotterill is our Patron of Reading 2016-19 and works closely with the school to inspire our students about reading and writing. Scroll down for more information about Jo and her work with us so far. 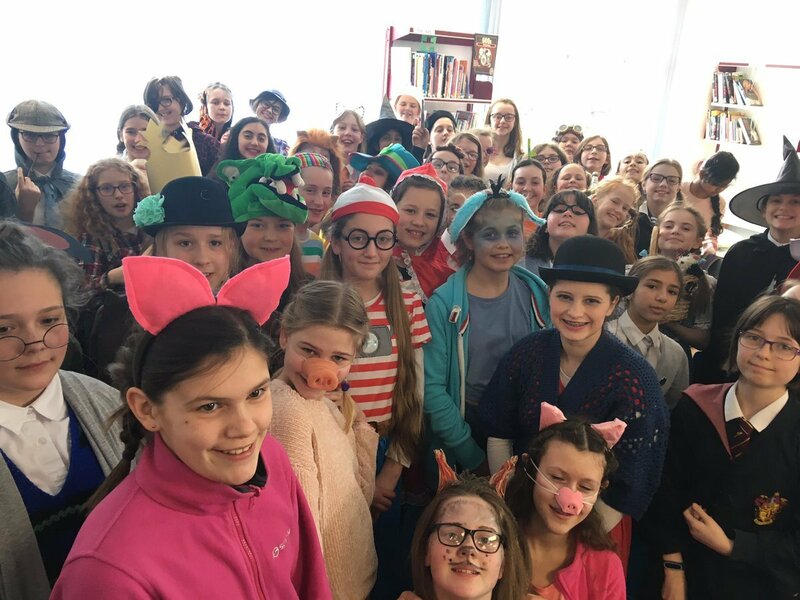 Throughout the week beginning Monday 4th March, Didcot Girls' School held a number of activities, talks and competitions in celebration of this year's World Book Day. Students enjoyed a World Book Day video in their assemblies, which featured many different members of staff reading sections of 'Little Red Riding Hood' from Roald Dahl's Revolting Rhymes. Tuesday saw Year 7 enjoy a talk from M. C. Stevens, author of the upcoming 'Warrior Monkeys' book series. Her talk was funny and inspiring, and explained how the important values taught through martial arts - like focus and resilience - are invaluable throughout wider life. Mary then went on to hold a workshop on the writing and publishing process with Year 11 and Year 13 students. Our celebrations for World Book Day itself saw Pam Smy return to DGS on Thursday to talk to Year 8 about her book 'Thornhill' and the fascinating creative process behind it. Selected students then also took part in a workshop with Pam, where they worked on creating atmosphere in their drawings. This was followed by our annual book character costume competition, which gets bigger and bigger every year! Students had the option of coming to school in their usual school uniform, or dressed as a favourite book character. Participating students paid £1 each, which is being donated to Dolly Parton's Imagination Library. In the afternoon, we welcomed Year 5 students from Sutton Courtenay Primary School, who took part in some paired reading with one of our Year 8 classes. During the course of the week, students were also encouraged to scour the school site for book-related facts. Ennis came in first place, with the highest number of correct answers recorded. 10 bonus points were also awarded to Adie house, thanks to Carys Sharp submitting the most interesting book fact of the contest, which was that The Beatles had wanted to feature in a film adaptation of The Lord of the Rings, which would star John Lennon as Gollum! 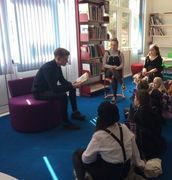 Other week-long activities included story-telling and book sharing in the library, led by our sixth form students, and a book swap enabling students to get their hands on some fantastic second-hand books! Over the past weeks, Miss Thursfield has been working with 7ELE to produce a new mural to go up in the library. This has been completed in time for our Book Week, and now stands as a stunning celebration of books that will last for years to come. It has been an action packed week of celebrating all kinds of literature. Thank you to all the staff and students who got involved to share their love of books with each other. We look forward to next year's celebrations for World Book Day! In celebration of Harry Potter Book Night 2019, we held a Harry Potter themed baking comeptition on 6th February. There were so many fantastic entries that we decided to have four categories on which the cakes were judged so that we could properly celebrate students' efforts. House points were allocated to all the winning entries, and Kennedy came out on top with more entries than any other house. Year 7 students also enjoyed watching 'Harry Potter and the Philosopher's Stone' in the library after school! 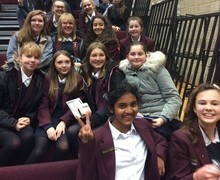 On Wednesday 7th November, the Reading Ambassadors spent the afternoon at Oxford High School to watch the Oxfordshire Book Awards ceremony. This year was the tenth anniversary of the event and, as ever, many of the nominated authors were in attendance. Matt Brown showed the audience how to draw Superbat, (to varying degrees of success!) Greg James and Chris Smith treated us to a snippet from their upcoming Kid Normal book, and Pam Smy shared her top tips for becoming an illustrator. We were also asked to share a review of Lisa Williamson's book 'All About Mia', which many of our students had voted for and was Highly Commended at the awards. Alice Hoddinott, who particularly loved this book, took on the daunting challenge of reading her review in front of an audience of around 300 people, which included the author herself! At the end of the prize giving, we were excited to learn the six books that have been nominated for next year's awards, which the Reading Ambassadors will begin reading soon. The Oxfordshire Book Awards is particularly exciting because the winners are chosen exclusively by students. So, if you've read any of the following books and think it a worthy winner, please let Mrs Barnes know and she can put forward your vote. The event closed with cake to celebrate this year's winners, and the opportunity for students to buy the books, and even get them signed by the authors. 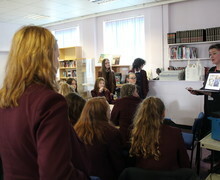 On Thursday 8th March, Pam Smy visited Didcot Girls’ School to talk to Year 8 students about her book, ‘Thornhill’. Pam has provided the beautiful illustrations to accompany many novels, including some by the award-winning author, Linda Newbery. ‘Thornhill’ is a wonderfully gothic book, inspired in-part by some of Pam’s own favourite novels, most notably ‘The Secret Garden’ by Frances Hodgson Burnett, as well as Jane Austen’s ‘Emma’. Pam weaves together two narratives, one told as diary entries from a girl writing in 1982, and the other told through a series of haunting black and white illustrations of a girl living in 2017. Students were fascinated to hear about the painstaking hours Pam lovingly spent researching, sketching and model-making, before arriving at the finished piece that is now ‘Thornhill’. 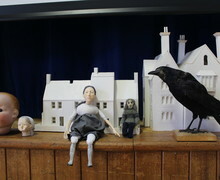 Following this, selected Year 8 students took part in a workshop with Pam, focusing on showing emotion in illustration. Students learned about the importance of symbolism and produced some beautiful work conveying a wide range of feelings. Over lunch time, students were able to meet Pam and buy copies of her book, which she signed and dedicated to them. We were lucky enough to get one of the library’s copies of ‘Thornhill’ signed too! The students, particularly the excitable Year 7 and 8 Reading Ambassadors, were thrilled to have the opportunity to meet Pam and take a closer look at her models and sketch books, as well as ask any questions there hadn’t been time to ask during the talk. Pam’s visit was the perfect highlight for International Women’s Day 2018, with the illustrator sharing inspirational advice on following your dreams, being confident with who you are and being true to yourself. ‘Thornhill’ is available to borrow from the school library. It has been nominated for the 2018 Oxfordshire Book Awards, and the prestigious Kate Greenaway Award for illustration. DGS students didn’t let the cold weather dampen their creative spirit for today’s World Book Day. 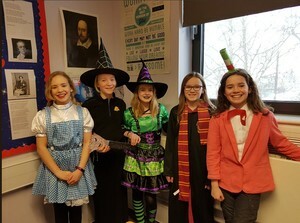 A number of students spent the day dressed as their favourite book character, drawing inspiration from classics such as ‘Harry Potter’, ‘The Wizard of Oz’ and ‘Mary Poppins’ to name just a few. At lunch time, the library was packed with audience members and performers for our first ever Poetry and Song-writing Competition. Participants were free to write a poem, verse or song, the only condition being that it be written from the point of view of a book character. Our Patron of Reading, Jo Cotterill, came in to school on 20th February to work with students on their lyric and music writing, in preparation for the competition. The range of entries was incredible, including a two-piece performance from the point of view of Voldemort that featured epic rap sections, and a heart-felt piano-accompanied song written from the perspective of the lead character in Jo Cotterill’s ‘Looking at the Stars’. Our Patron of Writing, Elaine Baker, was here to judge the entries, and was thrilled with both the turnout to the event, and the extraordinary talent and confidence the performers displayed. She now faces the challenge of deciding on a winner! Many thanks to Jo, Elaine, and Mr Dingley, as well as all the students who took part. 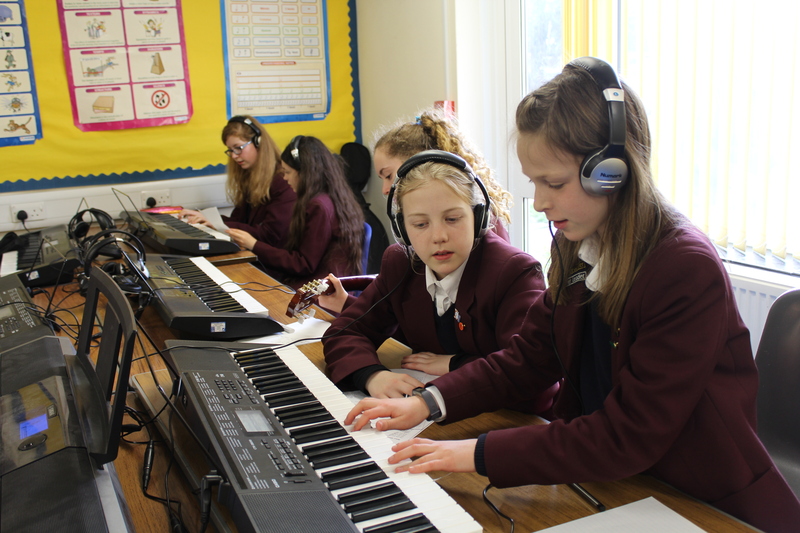 On Tuesday 20th February, students from Years 7, 8 and 10 took part in a song-writing workshop with Jo Cotterill, our Patron of Reading. Inspired by the protagonist in Jo’s latest book, Jelly, the students spent the first half of the two-hour workshop writing lyrics from the point of view of a book character. They then spent the second half turning these into songs that incorporated keyboards, guitars, and some very talented singers. 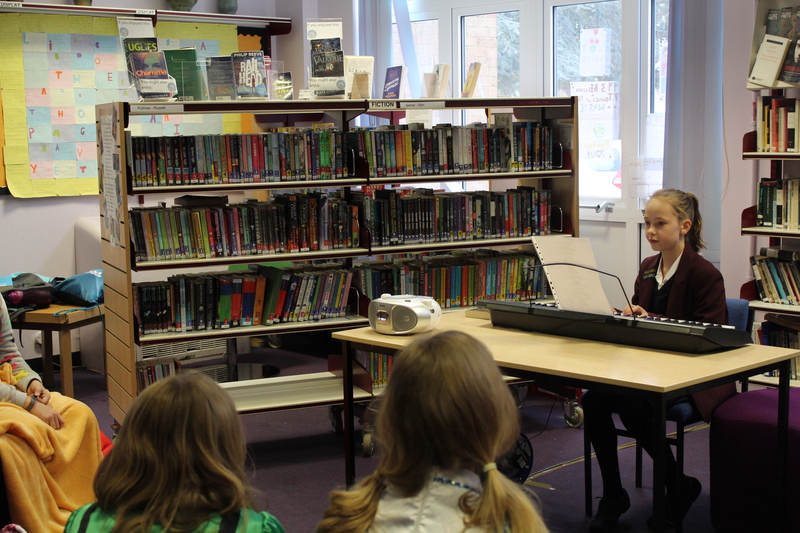 This was the first time Jo has used music in her writing workshops, and it was a great success. The students are being encouraged to perform their pieces at the DGS Poetry and Song-writing Competition taking place on Thursday 1st March, in celebration of World Book Day. Participating students will come to Cockcroft Hall at lunchtime to have their entries judged by our Patron of Writing, Elaine Baker. We can’t wait to hear the songs in all their glory! Thank you to Jo, and to Mr Dingley, for making this fantastic event happen. We are excited to announce the first DGS Poetry and Song-writing Competition! Take a look at the video below for an introduction from our Patron of Reading, Jo Cotterill. The closing date for the competition is Thursday 1st March - World Book Day - when students will perform their entries to our Patron of Writing, Elaine Baker, at a lunchtime event in Cockcroft Hall. Entries can take the form of poetry, lyrics set to music, or a whole song, and should be written from the point of view of a book character. 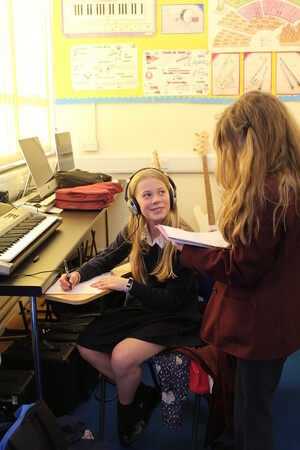 We are also offering students the opportunity to take part in a song-writing workshop with Jo Cotterill and Mr Dingley on Tuesday 20th February, in which they will work on their entries. For more information, pick up a letter from Mrs Barnes or Mr Dingley. Best of luck to you all - we are looking forward to seeing your entries! Take a look at the video below for an introduction to our Patron of Reading, Jo Cotterill! Hello, DGS! I am VERY excited to be your Patron of Reading 2016-2019! I'm looking forward to meeting lots of you and hearing about the books you love/hate/want to climb inside as well as all your brilliant ideas for stories and characters. I'll be coming in for events every now and then, and also to recommend books to you that I've read and loved. I've been publishing books for children since 2004 and now have over 25 to my name. I used to be an actor and then a teacher (GCSE English in an Oxford school!) but now I write full-time at home in Kidlington. I went to an all-girls school myself, so the environment at DGS feels very familiar and homely. My latest books are the Electrigirl series (about a female superhero, partly told through comic strip) and A Library of Lemons, a story about a girl who loves books and discovers friendship. I've also won some awards for my novel Looking at the Stars, which is about a girl who loves to make up stories and realises that her imagination is the best asset she could have as a refugee. When I'm not writing, I write songs for my band First Draft (three children's authors and one bookseller) which performs occasionally at book and music festivals. I also love crafts, especially card-making, and spend far too much money in Hobbycraft. Do come and say hi if you see me around school! Take a look at the video of Jo announcing the winners of her t-shirt design competition! As our DGS Patron of Writing, Elaine Baker works alongside students and staff to inspire and stimulate creative writing across the school, as well as to promote the writing profession as a potential future career pathway for students. Elaine has been a story writer since the age of around six years old. She has always had a particular passion for poetry and after studying creative writing with the Open University in 2009, began submitting work for publication. In the last five years, she has had continued success with publication and has recently been working on her first poetry collection. 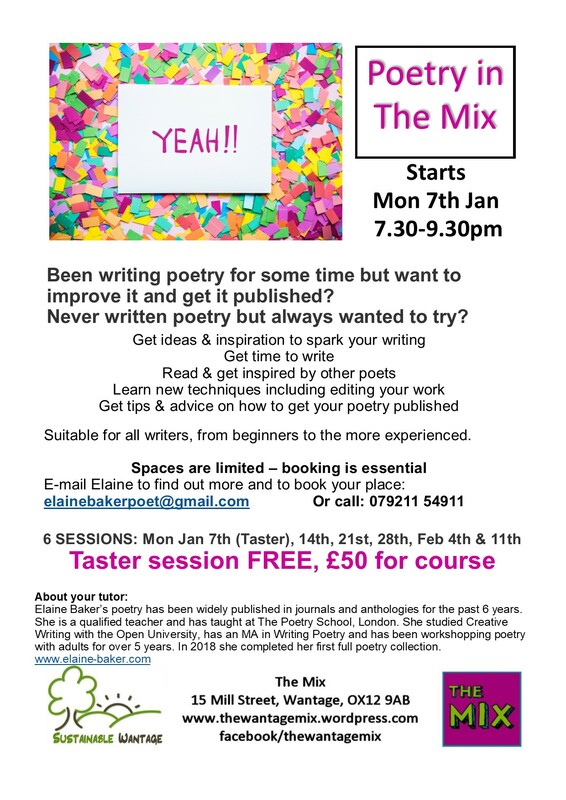 She is currently a poetry Masters student at The Poetry School, London and has read her work at the Troubadour Cellar Club, London. You can read more about Elaine’s work on her website, elaine-baker.com and follow her poetic reflections and #poetweets over the summer on Twitter @kitespotter. Elaine is delighted to be taking on the role of Patron of Writing at DGS and is very much looking forward to: getting creative and wordy with Year 9 and 10 students in writing workshops in English lessons; mentoring a small group of Year 9 and 10s throughout the year and supporting them in creating their own work; leading a session for some of our Year 7 and 8 Advanced Learners; tailoring and running a special session for Sixth Form and, alongside the students, putting together a celebration of all things wordy in DGS’ very first Word Week, in term 6 next year. We also look forward to Elaine working alongside Jo Cotterill, DGS’ Patron of Reading to celebrate reading and writing for pleasure throughout our school community.